My friend Ruth, who has an apron fetish, convinced me to buy this homemade red satin apron at a farmers’ market in Saint John, New Brunswick during our trip to Canada’s East Coast this summer. It’s fun yet practical, and it’s red, my favorite color. Red satin in the kitchen… or maybe the bedroom… The lady who made the apron commented, “It may also come in handy in the bedroom!” Have a great Wordless Wednesday! 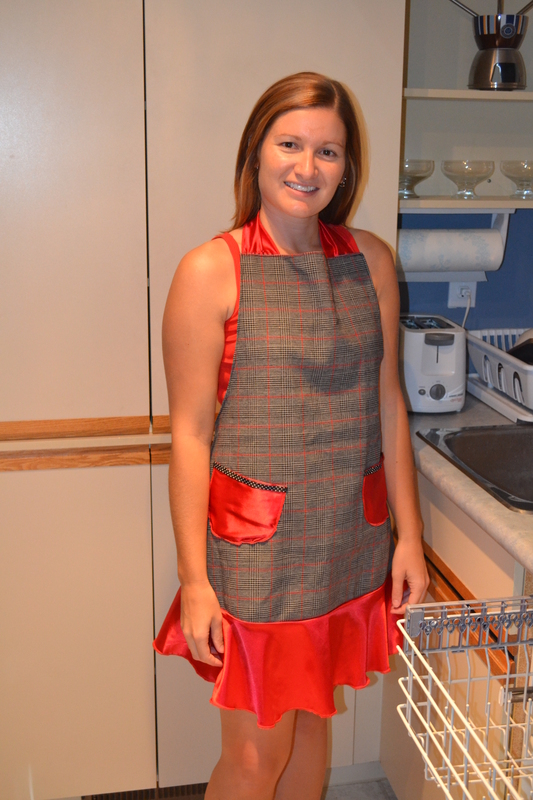 Modelling my new apron in my kitchen. Thanks to my friend Pearl for snapping this pic! 1. An apron can help deal with spills by allowing you to wipe your hands on it – and when is it really okay anymore as adults to wipe your hands on your clothes? 2.You get the look of a serious and professional cook when wearing an apron. 3. Depending on your mood more than one apron option may be called for – you are feeling serious = a professional chef half apron – you are feeling fun = a frilly full apron – you are feeling nostalgic – an apron from your grandma – the list can go on and on!